What is a stye? We need to understand this before simply reaching for the home remedies for styes. A stye, also referred to as a hordeolum, can afflict persons of all ages. These painful, red lumps are typically found near the edge of your eyelid and closely resemble a pimple or a boil. These uncomfortable masses are often filled with a pus-like substance, and in most cases it clears on its own within a few days; however, there are occasions when this condition needs help leaving your body. Home remedies for styes speed the recovery time while providing much-needed relief. The most important factor to remember when it comes to styes is to never pop the boil as you would a pimple as this can spread the bacteria – Staphylococcus – and lead to a more serious complication. The following home remedies for styes were selected based upon its effectiveness at not only relieving pain, but also shortening the duration of an occurrence. 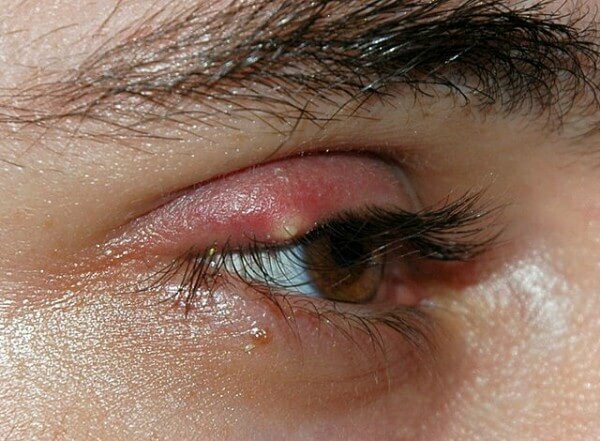 Due to the location of this infection, if the stye becomes worse or does not heal within a couple of weeks, you should visit your doctor for a more potent treatment option. To utilize this stye remedy, take a fresh potato and cut a small slice. Place the slice directly over your stye and allow it to soak. Alternatively, create a paste by warming a potato slice until its easily mashed and combine it with a small amount of water. Place the paste on a clean cloth and rest the cloth over the stye. This home stye remedy calms swelling and reduces pain. To naturally reduce inflammation without using synthetic anti-inflammatory medicine, bring 1 cup of water to a rolling boil. Remove from heat and place a washcloth into the water for several minutes. Remove the washcloth and allow it to cool slightly until it’s warm to the touch. Place the cloth directly over the stye and allow it to soak into the infected area for 15 minutes. Repeat this stye remedy up to four times per day until the stye is gone. The gentle nature of baby shampoo can help dry a stye for pain and inflammation relief. Simply add the 1 teaspoon of baby shampoo into 1 cup of water and stir thoroughly. Place a cotton ball into the solution and gently dab on the infected area. Repeat up to three times per day. This powerful home remedy for styes instantly soothes and calms irritation and inflammation. Simply take a cucumber and cut a thin slice. Place the cucumber slice directly on the stye and allow it to rest for 5 to 10 minutes. Repeat daily until the stye has been relieved. The magnesium content in Epsom salt actively works to eliminate bacteria that causes a stye infection. Simply add 2 tablespoons of Epsom salt into 1 cup of warm water and thoroughly stir. Place a clean cloth into the solution and squeeze out excessive liquid. Gently place the cloth directly over the stye and allow it to soak for 15 minutes. Repeat up to three times per day until the stye is gone. Considered an effective home remedy for styes, bitter gourd features powerful detoxification properties capable of reducing inflammation and pain associated with this infection. Simply cut a small slice of bitter gourd and rest the slice directly on the stye for 15 minutes. Repeat two times per day to calm pain, reduce inflammation and increase the natural healing time. This home remedy for styes is not the most pleasant in terms of smell, but the powerful antibacterial properties of raw garlic juice can significantly increase healing time. Crush two garlic cloves on a plate to extract its juice. Take a cotton swab and dip in the juice. Apply the liquid directly on the afflicted area; however, be extremely careful to not allow the juice into your eyes. Allow the juice to rest for 15 minutes before rinsing with warm water. Repeat once a day until the stye has healed. 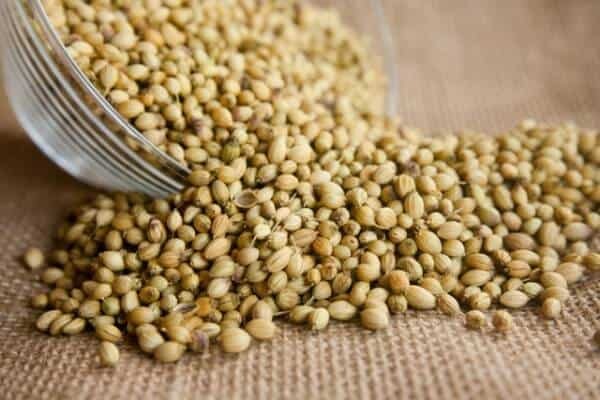 The active compounds in coriander seeds are known to hold powerful anti-inflammatory properties. To utilize this home remedy for styes, soak 1 tablespoon of coriander seeds in water for one hour. Strain the seeds out of the water. Dip a cotton ball in the water and apply directly to the stye. Repeat this stye remedy up to three times per day to reduce inflammation and soothe pain. Turmeric contains powerful anti-inflammatory properties capable of bringing instant relief. Bring 1 cup of water to a boil and add 1 teaspoon of turmeric powder. Stir until the ingredients are thoroughly mixed and dip a clean washcloth in the solution. Drape the cloth over the stye; making sure to keep your eye tightly closed. Allow the turmeric water to soak into the stye for 10 minutes before removing. Repeat this stye remedy up to two times per day. Aloe vera contains a host of active compounds capable of reducing inflammation and stimulating the natural healing process of your skin. The most important factor to remember when utilizing this home remedy for styes is to only use the juice from a fresh Aloe plant. Cut an Aloe vera leaf and squeeze out its pulp. With a cotton swab, apply the gel directly to the infected area. Allow the gel to rest on the stye for 30 minutes before rinsing clean with warm water. Repeat this stye treatmentonce a day until the stye has healed. The natural healing properties found in green tea banish bacteria and significantly reduces inflammation. Bring 1 cup of water to a rolling boil and pour over an organic green tea bag. Allow the bag to rest in the water for two minutes before removing. When the bag is comfortable to touch, place directly on the stye and allow it to rest for 15 minutes. Repeat this stye home remedy up to five times per day until the stye has healed. Before we get the the natural home remedies for thrush, let’s take a moment to lean a little bit about oral thrush. Have you noticed white lesions along your tongue, inner cheeks or on the roof your mouth? If so, then you may have a common condition known as thrush. In the most fundamental sense, thrush is caused by the fungus known as Candida albicans. When conditions are just right, this fungus begins to grow uncontrollably along the mucus membranes within your mouth. Although this is a natural fungus part of the fungal strains within your skin flora, however, when the delicate balance used to keep fungal growth under control is disturbed, the result is thrush. If you’re suffering from thrush and wish to naturally treat this condition, then you should turn to home remedies for thrush. As with any medical condition, should its symptoms increase in severity after several weeks of self-treatment, you should visit a physician as you may be dealing with a serious yeast infection. This is especially important for those with a weakened immune system as a compromised immune system can make eliminating thrush a difficult task. The following home remedies for thrush were selected for their safety and efficiency. Adults and children may use these natural remedies for thrush. As with any other type of yeast/fungal infection, you may need to modify your diet to help restore the natural flora balance required to ward off thrush. Green tea – also a natural thrush home remedy! Green tea seems to have uses for almost every bodily system. This medicinal tea features powerful antifungal, antiviral and antibacterial properties. Its primary active compounds delve into the cellular realm of your body to restore damage and inhibit the onset of infections, such as thrush. To utilize this home remedy for thrush, bring 1 cup of water to a rolling boil. 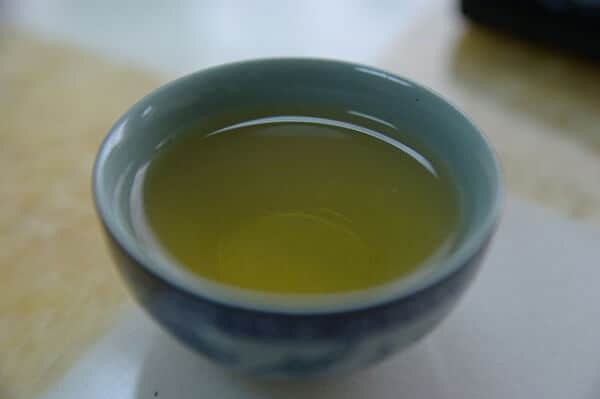 Add fresh green tea into the boiling water and a pinch of salt, remove from heat, cover and allow to steep for 10 minutes. Once the tea has cooled, take a cotton ball and soak it in the tea. Take the drenched cotton ball and wipe your tongue or any other area of the mouth suffering from thrush. Repeat up to 10 times per day until the infection is eliminated. Consider drinking up to two cups of fresh green tea per day as a preventative measure. The compound sodium bicarbonate – also known as baking soda – features powerful neutralizing properties. In fact, it’s typically a primary ingredient for antacids. 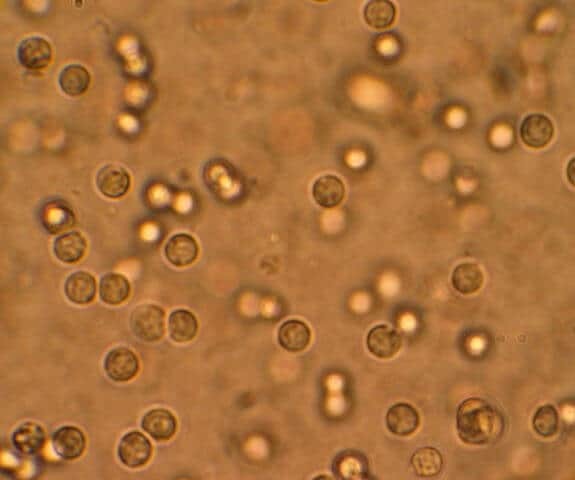 When it comes to oral thrush, the unique interactions between it and the yeast helps to promote a reduction in symptoms. Simply mix 50 grams of baking soda into 1 cup of boiling water. Thoroughly mix to dissolve the baking soda. Once the solution has cooled, dip a cotton ball in the mixture and apply directly to thrush lesions. Repeat up to 5 times per day to eliminate this yeast infection. The medicinal properties in apple cider vinegar make it one of the most effective home remedies for thrush. 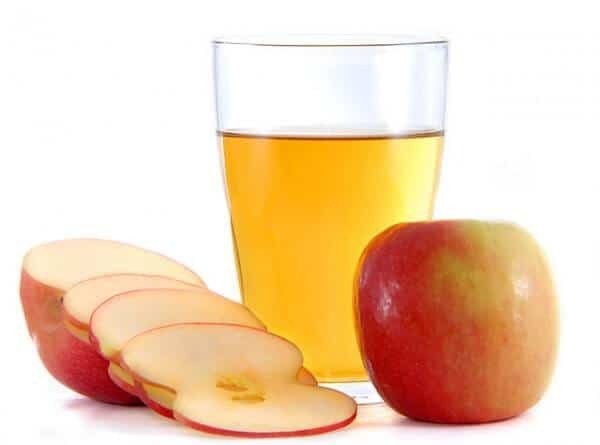 The acetic acid content in raw apple cider vinegar is strong enough to regain control over yeast growth without having to use synthetic medicines. To utilize this remedy, add 1 tablespoon of unfiltered apple cider vinegar into 1 cup of warm water. Simply use this solution as a mouthwash. Gargle for 30 seconds to 1 minute. Repeat up to four times per day. Never gargle with undiluted ACV as its strong acid content can be problematic for tooth enamel. Buttermilk – the delicious natural thrush home remedy! The active cultures found in buttermilk have the ability to reconstruct the yeast colonies within your mouth to help reduce and eliminate the symptoms of thrush. By restoring flora to normal levels, the yeast responsible for thrush will no longer be able to reproduce. Therefore, this is among the most effective home remedies for thrush, and it’s perfectly safe for children and adults. 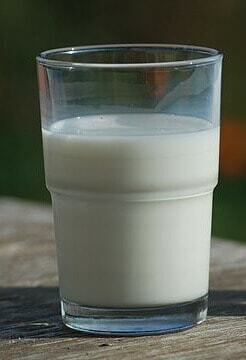 To utilize this home remedy for thrush, drink two glasses of buttermilk per day until the thrush is under control. Tea tree oil is among the most effective essential oils for thrush as it features powerful antifungal properties. There are several ways you can utilize this home remedy. The first is making a mouthwash. Add 3 to 5 drops of pure tea tree oil into 1 cup of warm water. Swish and gargle for 1 minute two times per day. Another thrush remedy, which is particularly effective for thrush infections around the gums, is to place 1 drop of pure tea tree oil on your toothpaste. Brush with this added oil two times per day. Make sure to swish the toothpaste mixture around your mouth after each brushing. When combined with the mouthwash solution, thrush is almost immediately improved. Much like tea tree oil, oregano oil is among the most effective home remedies for thrush. The active properties within oregano oil destroy the overgrowth of yeast and restore the natural flora balance. In fact, this powerful essential oil actively works to bring full restoration to its contact area, which inhibits the environment for thrush – and other infections – from growing. To utilize this remedy o treat thrush, make a mouthwash with 1 cup of warm water and 5 – 8 drops of pure oregano oil. Swish and gargle this solution in you mouth for 45 seconds to 1 minute. Repeat up to two times per day until the thrush is eliminated. Colloidal silver features powerful antifungal and antibacterial properties, which allows this simple ingredient to eliminate yeast overgrowth and inhibit the formation of thrush. When used as a mouthwash, colloidal silver not only restores the natural flora to eliminate thrush, but also kill off bacteria responsible for bad breath. To utilize this thrush home remedy, simply add 1 ounce of a high-quality colloidal silver to 2 cups of filtered water. Use daily as you would any other mouthwash. Continue to use on a regular basis to prevent the formation of thrush and bad breath. Perhaps one of the most effective home remedies for oral thrush is also one of the least known. The Pau D’Arco, also referred to as Lapacho, is an Amazonian plant with potent antifungal properties. There are several medicinal compounds found within this herb, which include: a variety of napthaquinones, xyloidones and lapachol. While each of these compounds are known to inhibit yeast overgrowth, lapachol is the most powerful as it’s been studied for its ability to stop the growth of Candida albicans, which is the primary yeast responsible for thrush. 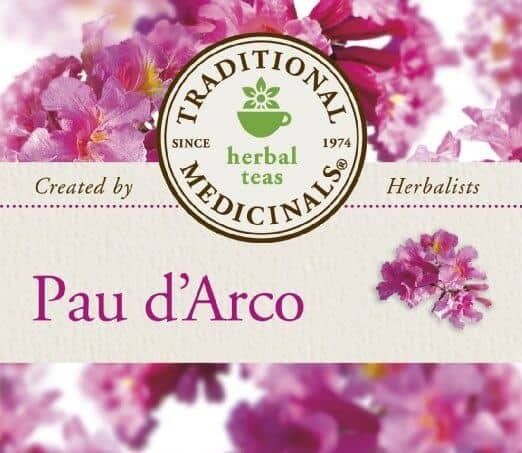 To utilize this home remedy, purchase high-quality Pau D’Arco tea leaves from your local herbal shop or from an online distributor. Bring 1 cup of water to a boil and add 2 tablespoons of the tea leaves. Cover and allow to steep for 10 minutes. Once the tea has cooled to a comfortable temperature, swish and gargle for 2 minutes. Repeat three times per day to eliminate thrush. Nausea within itself is not a disease, but rather a symptom of an underlying cause. There are literally dozens of reasons why your stomach can become upsets. Ranging from allergic reactions, motion sickness to food poisoning, while the causes of nausea can vary the need for immediate relief is universal. Officially defined as an unpleasant sensation within your stomach accompanied by an urge to vomit, finding relief for this common ailment is relatively simple, if you know where to look. Although there are many over-the-counter medications designed to provide relief, if you’re searching for a nature way to ease stomach discomfort, then you may want to turn to home remedies for nausea. The following home remedies for nausea were selected for their potency and ability to provide much-needed relief. As with any natural cure or home remedy, it’s important to try several methods in order to find the one that works best with your body. Because nausea can be stirred through a myriad of causes, there’s not a “cure-all” in the realm of home remedies. What works best for one person may not be the ideal choice for you. Because of this, it’s important to try several of these home remedies for nausea and make notes regarding the ones that worked best for you. Ginger has been utilized for centuries as a home remedy for nausea. Its effectiveness stems from its ability to neutralize stomach acid and relax stomach tissue through its phenol compounds. Ultimately, ginger works by calming irritated stomach lining while promoting healthier digestion, which makes it the ideal choice for many causes of nausea. Although there are many different ways to consume ginger, the most effective ways is to cut a 1/2-inch from fresh ginger root (make sure it’s been peeled) and consume. When it comes to nausea, many people begin to feel an urge of anxiety as they wish to avoid vomiting or simply hate the sensation. While this is perfectly natural, anxiety tends to make nausea worse. Therefore, one of the most effective home remedies for nausea is to simply breathe your way through it. Place your hand on your belly, and take deep breaths. Slowly focus on breathing and relaxing your body. These deep breaths help restore oxygen throughout your body, which may be lacking as anxiety often cause mild forms of hyperventilating – a situation known to make nausea worse. 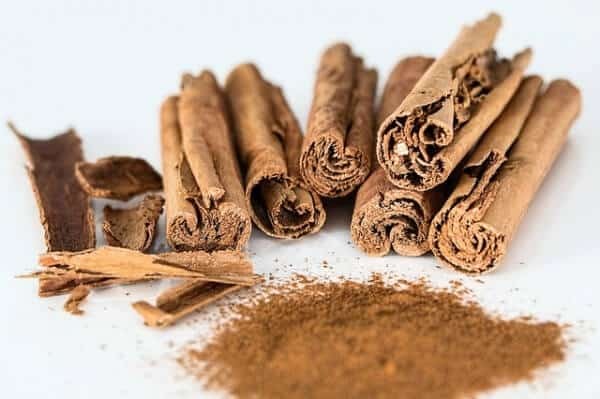 Cinnamon is an excellent nausea home remedy as it treats various causes of nausea; ranging from indigestion to motion sickness. While it’s effective, do not use this nausea remedy if you’re pregnant. To use this remedy, bring 1 cup of water to a boil and add 1/2 teaspoon of cinnamon powder. Allow the tea to steep for 10 minutes before straining and drinking. The volatile oils found in lemon is known to help calm your mind and upset stomach. 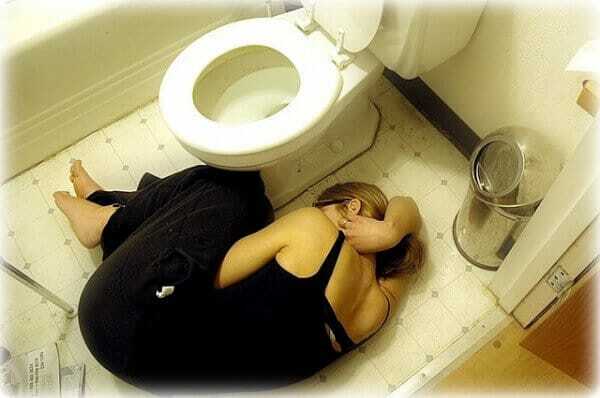 This nausea home remedy is especially effective should you become nauseous due to an odor. 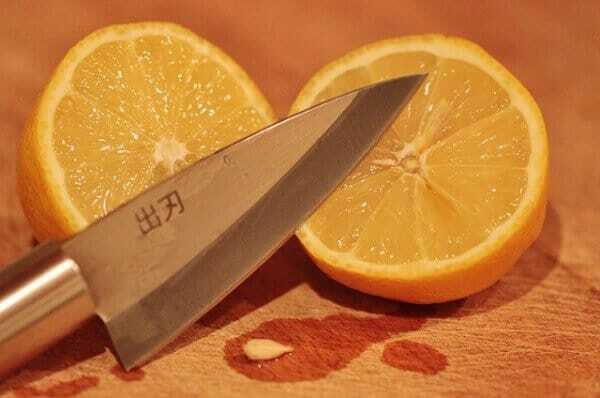 Simply take one whole lemon and cut it in half. Bring the lemon slice up to your nose and breathe in its scent. After a few minutes, your nausea should subside. The application of a cold compress to the back of your neck or directly on your stomach can help reduce nausea. This is an effective home remedy for nausea that’s caused by overheating – such as spending too much time out in the sun or in a hot car. Either wrap an ice-pack in a towel or soak a washcloth in ice water and drape the compress over the back of your neck or around your stomach. While allowing the cool temperatures to soak into your body, focus on taking deep breaths and relaxing your muscles. The volatile oils in peppermint tea help calm irritated stomach tissue and restore a natural balance to your digestive system. This is an effective natural home remedy for nausea caused by eating too much food or consuming a food that’s aggravating your stomach. Simply bring a cup of water to a rolling boil and place a peppermint tea bag in the water. Allow the tea to steep for 5 to 10 minutes before straining and slowly drinking. If you need an immediate relief from nausea or vomiting, call upon the natural healing powers of lime juice. The active compounds within this citrus fruit calm stomach linings and restore balance to your entire digestive tract, making it an ideal choice for those suffering from food-related nausea. To utilize this nausea home remedy, simply mix 1 cup of cool water with 1/2 teaspoon of sugar and 10 drops of freshly squeezed lime juice. Add 1/4 teaspoon of baking soda to help calm digestive juices and slowly drink. While this may not seem as if it’s a good idea when suffering from a serious bout of nausea, the active compounds in onion and ginger immediately reduce the symptoms of nausea and the need to vomit. Simply juice enough onion for 1 teaspoon and combine with 1 teaspoon of freshly grated ginger root. Add to 1 cup of water and slowly drink. This is perhaps one of the most effective home remedies for nausea as it calms your digestive system while restoring the natural balance of stomach juices. To utilize this home remedy for nausea, bring 1 cup of water to a rolling boil. Add 1/4 teaspoon of aniseed to the water. Cover and allow the tea to steep for 5 minutes. Strain the seeds out of the water and consume. If you want, add 1 teaspoon of fresh honey or agave nectar to sweeten. For millions of men and women, the goal of cultivating and sustaining a beautiful head of hair is universal. Although the desire for strong, illustrious hair is widespread, there are literally hundreds of reasons why your hair is lifeless, dull or thinning. The three most common complaints regarding hair is that it’s dry, damaged and thinning. Because of this, there are many home remedies for hair designed to combat the internal and environmental causes of lackluster hair. For men and women alike, thinning hair is a serious cause of concern. There are many reasons why your once thick, beautiful hair begins to thin. These include hormonal imbalances, nutritional deficiencies, stress and genetics. To help stimulate new, healthy hair growth the following home remedies for hair are designed to nourish hair follicles and increase blood circulation to the scalp. Begin by heating virgin (unprocessed) coconut oil in a double boiler until it’s warm to the touch. Make sure the oil is not too hot as you may burn your skin. Pour the oil over your fingertips and gently massage your scalp in a circular motion. The gentle pressure helps to stimulate blood flow while the medicinal compounds in coconut oil provide nourishment to hair follicles for maximum growth potential. Rosemary is one of the most effective herbs for hair growth as it strengthens roots, banishes dandruff and injects a vast array of antioxidants into your scalp. Additionally, the sulfur and silica concentrations of rosemary have been studied for its ability to reverse hair loss in both men and women. Begin this home remedy for hair growth by combining 2 to 5 drops of rosemary essential oil into two tablespoons of unprocessed coconut oil. Stir until the oils are thoroughly mixed and massage the solution directly to your scalp and hair. Allow the serum to soak into your hair for 30 minutes before rinsing off with warm water. Mix 2 tablespoons of freshly squeezed lemon juice with 4 tablespoons of unprocessed coconut oil. Once thoroughly mixed, apply it directly to your hair and scalp. Allow the solution to soak into your hair for 45 minutes before rinsing with warm water. Repeat up to two times per week. Did you know that each strand of hair features three distinct layers – the medulla (innermost portion), the cortex (second layer) and the cuticle (the outer layer). While the cuticle is designed to protect and safeguard your hair from long-lasting damage, excessive exposure to harsh hair products, environmental toxins and nutritional deficiencies all tax hair strands to the point of severe damage. The following home remedies for hair damage were chosen due to its effectiveness at correcting damage and restoring the natural luster of fresh, healthy hair. Filled with essential nutrients, such as fatty acids, vitamin E and several distinct antioxidants, olive oil is among the greatest home remedies for hair damage as it has the ability to correct the damaged layers of hair by encasing the hair cuticle with the nutrient-rich moisture. Not only does it correct previous damage, but it may also protect hair from future damage. To utilize this home remedy for hair, place 1/4 cup of olive oil in a small bowl. Fill a larger bowl with hot water and rest the smaller bowl within the water for several minutes. Do not heat in the microwave as this may deteriorate its nutritional content. Once the olive oil is warm to the touch, pour directly on your scalp and massage throughout your hair. Place a shower cap over your hair and allow the oil to soak overnight. Rinse with warm water in the morning. Repeat once week for prolonged protection. The goal when repairing dry and damaged hair is to inject a vast array of essential nutrients hair proteins require for genuine health and restoration. 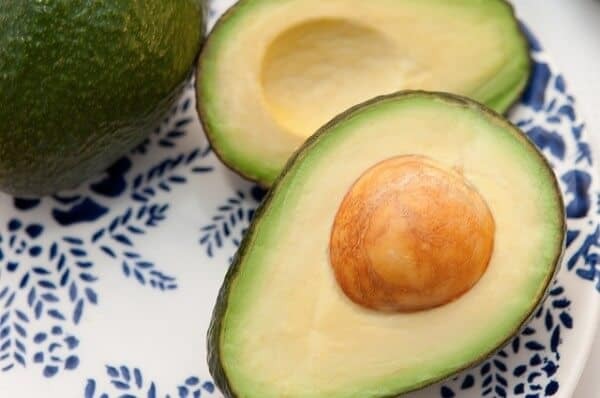 Avocados are considered a “Superfruit” due to its long list of nutrients. With every application, your hair is bathed in a myriad of vitamins, proteins, fats, essential fatty acids and natural oils. Many holistic practitioners believe these compounds soften hair to keep it flexible and hydrated by preventing cellular-level damage. Its capability of preventing free radical damage helps ensure internal and environmental toxins do not cause further damage, which can ultimately result in hair loss. Begin by scooping the pulp out of 1 ripe avocado and placing it into a blender. Add 2 teaspoons of extra virgin olive oil and blend until its consistency is smooth and creamy. With your fingers, massage this mixture throughout your hair. Make sure to thoroughly coat each strand of hair. Allow the solution to soak into your hair for 1 hour before rinsing with warm water. Repeat at least once a week for maximum restoration and protection. Aloe vera is perhaps one of the most well-known home remedies for skin damage; however, it’s also among the greatest home remedies for hair restoration due to its unique active ingredients. Its unique humectant properties penetrate deep into the inner core of hair strands to restore its cellular integrity. With every application, a myriad of amino acids, enzymes, vitamin C, vitamin E and polysaccharides circulate throughout the hair follicles to repair damage and stimulate hair cell regeneration. The most important element to keep in mind is to never use Aloe vera from a bottle. The most powerful compounds are derived directly from the Aloe vera plant. Simply purchase a mature Aloe plant and break open one of its leaves. Squeeze the juice from the leaf and apply throughout your hair. Make sure to massage the juice directly into your scalp. Allow the compounds to soak into your hair for 15 to 20 minutes before rinsing with warm water. Repeat up to two times per week for noticeable benefits. Home Remedies for Gas | Natural Gas Relief That Works! Chances are you’ve found yourself in a gas emergency. No, we’re not talking about gasoline, but rather, intestinal gas formulated by the natural digestion process. 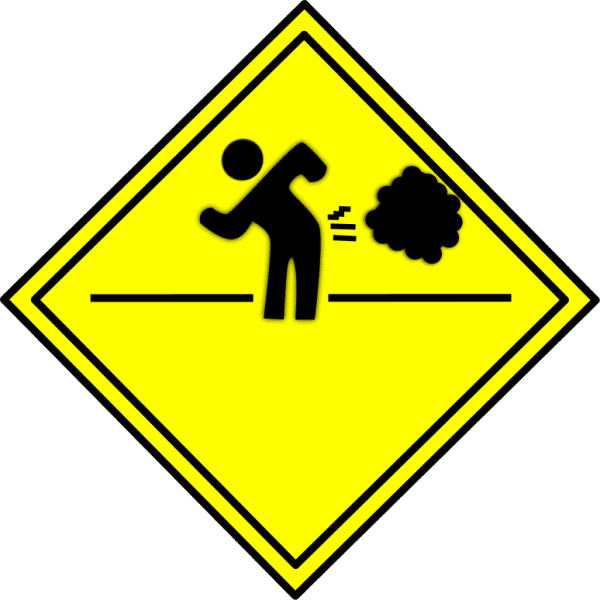 Although your diet plays a direct role in the severity of gas, or flatulence, there are millions of people who are genetically predisposed to excess gas production. Whether you wish to find relief for periodic bouts of excess gas or need a long-term solution for continuous relief and protection, there are several simple home remedies for gas capable of bringing instant relief from both uncomfortable and embarrassing gas. Perhaps some of the most effective home remedies for gas are derived from all-natural herbal sources. In particular, the carminative herbal family is known throughout the holistic and contemporary medical fields as a substance capable of the expulsion and removal of intestinal gas, according to the Academy of Nutrition and Dietetics. One of the most common reasons for excess gas accumulation is an imbalance in gut bacteria. While many think bacteria to be a bad thing, when it comes to the cellular health and operation of your digestive system, gut bacteria plays a direct role. Probiotics are living microorganisms capable of supporting the entire function of your digestive system. Specifically, the probiotics known as Bifidobacterium lactis and Lactobacillus acidophilus are known to ease intestinal gas and bloating. As with all home remedies for gas, it’s best to consume probiotics from food or natural sources rather than via supplements. This being noted, research has found even over-the-counter probiotic supplements gave participants relief from intestinal gas. Perhaps one of the most successful non-herbal home remedies for gas is derived from buttermilk. A common remedy for gas and indigestion in Ayurvedic medicine, buttermilk calms the stomach and promotes natural gas relief without the harsh compounds found in over-the-counter gas relief aides. Although you may drink a glass of buttermilk for instant relief, the effectiveness of this home remedy for gas is increased when combined with carom seeds and black salt. To utilize this remedy, mix 1 teaspoon of carom seeds, 1 teaspoon of black salt into 6 ounces of buttermilk. If you can’t find carom seeds, many holistic experts suggest adding 1 teaspoon of celery seeds as it feature similar biological action. Thoroughly combine the ingredients and drink whenever you need relief from gas and indigestion. 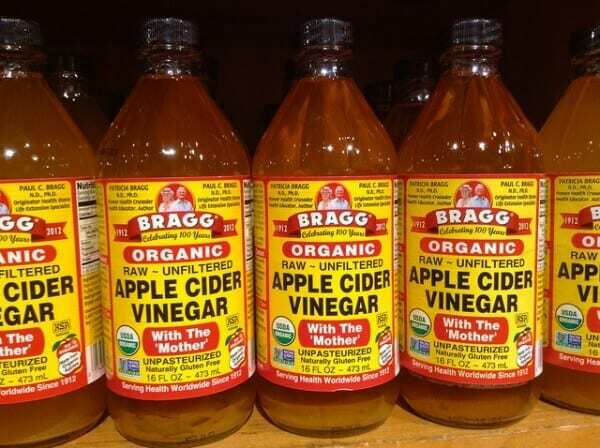 Apple cider vinegar is considered a megastar in the home remedy realm. This simple compound is used to treat everything from eczema to hair growth; however, some of its proposed uses are not as effective as others. Yet, when it comes to relieving gas, pure apple cider vinegar can help stimulate your digestive system for immediate relief of gas and bloating. To utilize this home remedy for gas, simply add 2 tablespoons of apple cider vinegar to 6 ounces of room temperature water. Add 1 teaspoon of agave nectar or honey, for flavor, and consume whenever you feel the familiar gas pains. A traditional home remedy for gas is also one of the most effective. The use of combining baking soda with freshly squeezed lemon juice creates an all-natural antacid capable of calming your stomach and relieving intestinal gas. 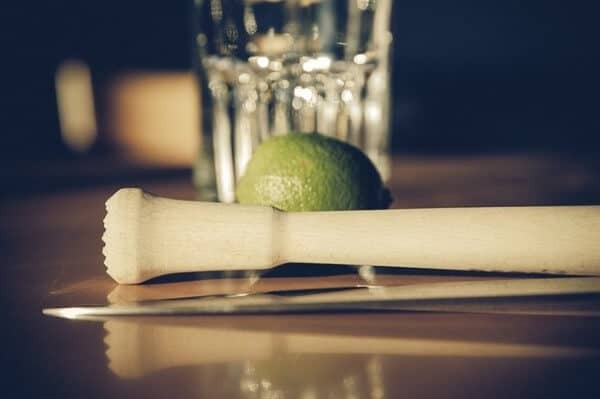 To utilize this remedy, simply squeeze one whole lemon into a glass. 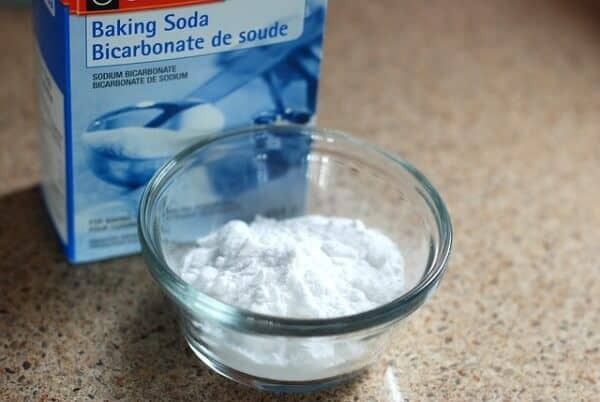 Add 1 teaspoon of baking soda, which will cause of a chemical reaction in the form of fizz. Fill the glass with 5 to 6 ounces of room temperature water. Stir until the baking soda is completely dissolved. Slowly drink. Repeat whenever you need instant natural relief from gas. Whether you have bloating from a heavy meal or are battling a serious case of flatulence, asafetida is capable of providing near-instant relief due to its anti-flatulent and anti-spasmodic properties. A common ingredient in Indian cuisine, this herb is a powdered gum resin featuring a strong onion-garlic flavor. Although its taste may be quite strong, it’s effective at relieving bloating and gas is just as strong – if not more. To utilize this gas home remedy, simply add a pinch of asafetida powder into a 6 ounce glass of warm water. Thoroughly stir until the powder has dissolved, which is why you must use warm water, and drink up to three times per day. Many utilize this remedy as a preventative agent before going out or before consuming a meal known to cause bloating and/or gas. Although it may be one of the strongest remedies in terms of flavor, it’s also one of the most powerful home remedies for gas. Everyday ground black pepper is known to enhance the flow of gastric juices, which is imperative to swiftly move food throughout the digestive system. This increase in digestive power also helps prevent gas accumulation. To utilize, simply pour 1 teaspoon of ground black pepper into 3 ounces of warm water. Drink up to two times per day or whenever you need relief from gas or indigestion. There’s no doubt about it, fruit flies are an incredibly common, and incredibly irritating household pest. Found in homes across the land, particularly during the summer months, these flies reproduce at a ridiculously fast rate (they can lay up to 500 eggs at a time), meaning once you’ve got one buzzing around your kitchen, it is likely to be joined by swarms of friends in no time at all. Fruit flies thrive in moist damp places, so they are most commonly found around the sink and garbage disposal drains, as well as close to fruits and other foods (particularly rotting or fermenting foods), but these makes baited fruit fly traps very effective! If you’ve got a fruit fly infestation, you’ll probably know about it as you’re sure to spot both the adult flies and the pupae around your home. 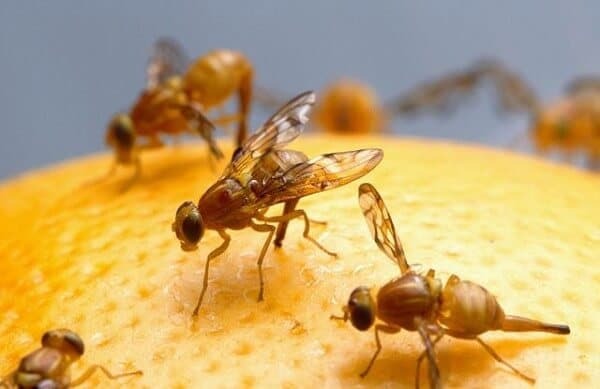 The adult fruit flies are often seen flying around the kitchen or trash cans, and are particularly present around decaying fruit and vegetables, as well as liquor and beer bottles. Once they start to mature, the fruit fly larvae crawl out of the breeding material and into a nearby dry spot where they pupate. Although it is easy to mistake the fruit fly larvae for rodent or cockroach droppings, they are distinguishable by a pair of horns on one end of the pupae. So, in an attempt to rid your kitchen of these pesky fruit flies, here are our top homemade fruit fly traps that will allow you to kill and remove fruit flies quickly and simply… Getting rid of fruit flies is simple when you use the following traps. Fruit flies are huge fans of fruit, so this is the perfect way to lure them into your fruit fly trap. Take several pieces of ripe, ideally overripe fruit, and place them in the bottom of the glass jar or bowl. Cover the jar with Saran Wrap, securing it with a rubber band. Using the toothpick, poke holes in the wrap. Set the jars around the house, focusing in the areas where the fruit flies seem to congregate. The flies will be drawn to the trap and will successfully find their way in, but won’t be able to get out. When the jar is full enough, submerge it in a bucket of warm, soapy water and allow it to sit for around 10 minutes to kill off the fruit flies. Rinse out the jar, then refill it with overripe fruit and repeat the process. Your home will be fruit fly free in no time at all. This is an incredibly simple trap that should help to catch any rogue fruit flies. This fruit fly trap works on the concept that fruit flies can’t resist the smell of fermentation and so flock towards the apple cider vinegar, which is, of course, made from fermented apples. <Firstly, heat the apple cider vinegar and pour it into the mason jar. 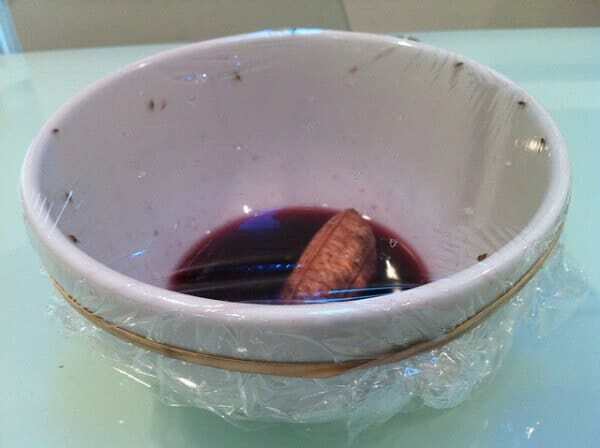 The vinegar should be just deep enough for the flies to drown. Add a couple of drops of dish soap to the apple cider vinegar. This will break the surface tension of the liquid and prevent the flies from sitting on the top and flying away. Insert your funnel into the mouth of the jar and tape it in place. If you don’t have access to a funnel, simply roll up a piece of paper to make one. The flies will then enter the jar through the funnel, but won’t be able to get back out again. To make the jar extra tempting, drop in a piece of ripe fruit and allow it to break down in the mixture. Now all you need to do is wait! If you find that the flies don’t drown when they enter the jar, simply place it in the freezer for around 20 minutes and that should kill the fruit flies. Like many of us humans, fruit flies are drawn to red wine and, once you’ve caught them, it’s easy to kill them in their intoxicated state. This fruit fly trap is extremely easy to make! Simply leave a small amount (around half a glass) of red wine at the bottom of the bottle. Leave the open bottle out on a surface, close to where the fruit flies seem to lurk. The flies will flock to the wine, fly into the bottle, and then get stuck. The flies should drown in the wine, but if they don’t, simply place the bottle in the freezer or fill it with warm soapy water. Firstly, remove the cap from your bottle of apple cider vinegar. Remember, it doesn’t necessarily need to be a full bottle, a nearly empty bottle will have the same effect. Cover the opening of the bottle with Saran Wrap and secure it in place with a rubber band. Using the toothpick, poke a hole in the Saran Wrap to allow the fruit flies to enter the bottle. Put the bottle in the main problem area and then sit back and wait. The flies will be attracted by the scent of the vinegar and, once they enter the bottle, they’ll find themselves stuck and will drown. This tried and true homemade flytrap method has been used for centuries. Although it might seem like an unusual recipe, it’s a sure fire way to get rid of fruit flies. Combine the milk, sugar, and pepper in a saucepan and allow the mixture to simmer over a low heat for around 10 minutes. Next, pour the mixture into shallow dishes and place them around the house, strategically targeting the spots that the fruit flies seem to flock to most. We’re not entirely sure why, but the fruit flies are drawn to the mixture and, once they land in it, will quickly drown. If you notice that the flies seem to be landing and flying away rather than drowning, simply add a drop or two of dish soap. 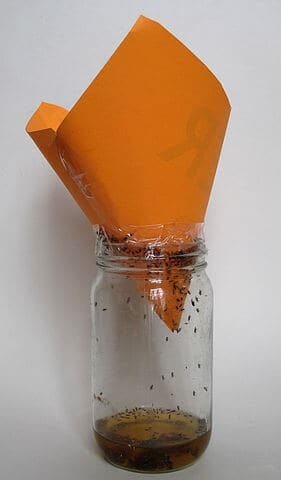 This is another quick and easy way to make a fruit fly trap, which uses things you’ll have lying around your home. Take a pair of scissors and carefully cut the empty soda bottle into two parts. You should make the cut approximately ¼ to 1/3 of the way down the bottle to ensure that the bottom half is larger that the top half. Remove the cap from the top of the bottle and turn the top half upside down. Take a few pieces of rotten produce (potatoes seem to work particularly well) and place them in the bottom half of the bottle. Take the top half of the bottle and place it upside down inside the bottom half, creating a funnel effect. Next, tape the two halves of the bottle together to ensure that they stay securely in place. This isn’t technically a fruit fly trap, and it won’t kill the fruit flies, but it should help to keep them away from your home. And we all know that prevention is better than cure. Start by pouring 2 ounces of hot water into the spray bottle. Add 10 drops of Lemongrass essential oil and shake well to mix the two ingredients together. Spray the Lemongrass mixture over windowsills and doorways. This should keep the flies away. If you notice any fruit flies around the house, you can also spray the mixture directly onto them. As well as keeping fruit flies out of your home, the Lemongrass spray also leaves a nice, refreshing citrus scent around the house. There are a number of simple steps that you can take to eliminate the source of the fruit flies and keep them out of your house. Firstly, make sure that you don’t leave any ripened fruit or vegetables exposed. 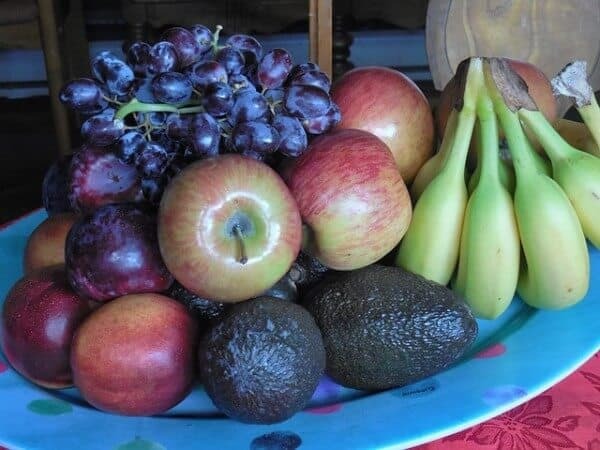 Get a fruit bowl cover or keep them in the refrigerator where the flies can’t get to them. In addition to this, you should also clean your recycling bins regularly and make sure that any bottles or jars you place within the recycling bin are clean and free from food residue. If you compost your food waste, make sure your compost bin is positioned as far away from your house as possible. You should also check that your garbage cans are free from any small bits of food or liquids. The fruit fly traps listed on this post are highly effective at trapping and killing fruit flies. Combined with the common sense prevention advice, getting rid of fruit flies should be easy and your home will be fruit fly free in no time at all. Before we discuss natural tick repellent recipes and tick bite prevention, let’s take a moment to learn a little more about ticks and their dangers. Ticks. They’re rightly considered to be one of the most unpleasant pests of the insect world. However for those who love nature, or those who are even outside for any longer than a little while, the likelihood of getting a tick bite can be pretty high. Also, whilst the internet is full of blogs, guides and articles, it seems that many seem to conflict with one another as to how to avoid tick bites. So let’s take a look everything you need to know about ticks, from the symptoms of a tick bite, right through to the natural tick repellents that actually work, and along the way, we’ll try to debunk the most common tick myths and misunderstandings. As far as insects go, it’s safe to say that ticks are very unpleasant. They’re ugly, difficult to spot, painful and their feeding habits are pretty disgusting. What’s more, as they latch on and don’t let go until they’re filled with blood, you can be stuck with a tick for anything from a matter of days through to a number of weeks. And once full, they can reach the size of a marble, turning a green blue colour, before falling off. Oh, and did we mention that when they fall off after they’ve been a right pain, they quite simply roll over and die. Pretty pointless, right? And what happens if you do pull them off? Well, without wanting to put anyone off their dinner, if you pull off a tick that is in full latch mode, you’ll likely end up with just the body, with the head remaining firmly underneath your skin. This can then lead to both a painful and potentially dangerous abscess that has the potential to turn sceptic. Not sure whether you’ve been bitten by a tick? Well the following symptoms can all appear within a matter of the minutes after the bite. There’s been many a myth circulated in the past concerning whether ticks are attracted, or repelled, by certain blood types. But we can clear this up once and for all by assuring you that it is absolute nonsense. Ticks are creatures of opportunity and, if they see a nice bit of flesh that’s within reaching distance, they’ll latch on. It’s as simple as that. So what about the unlucky ones who seem to get bitten ALL of the time? Well it would seem that this is simply down to bad luck (as well as perhaps a poor choice of clothing and repellent). However, with all of the helpful tips and tricks that are stored within this blog article for you, your luck, when it comes to ticks, is about to get whole lot better. Step One – Heat up your water. Step Two – Whilst the water is heating up dice up your lemon and garlic. You needn’t be too careful with getting your chopping precise, or too finely cut, just cut them roughly. 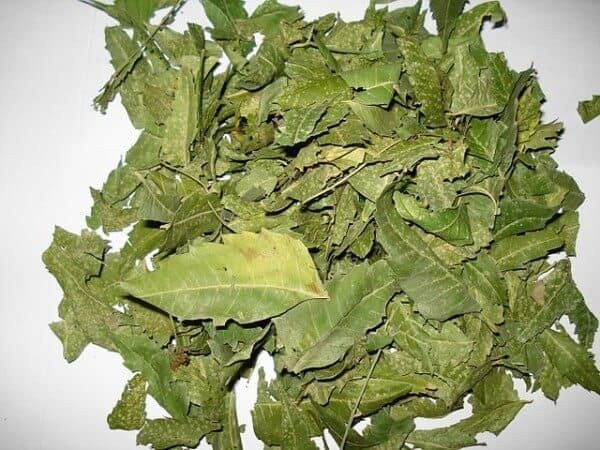 Step Three – Measure out two tablespoons of dried neem leaves. Step Four – Once your water is boiling you can add in your ingredients. Step Five – Cover you sauce pan over and leave it to simmer on a low heat for between fifteen to twenty minutes. Step Six – Remove the mixture and set aside, leaving it to cool down. Step Seven – Place your funnel into the spray bottle that you have a carefully positioned over the top. You should then take care to slowly pour through your mixture through the strainer. The strainer will then catch all of the solids, with the liquid filling up the spray bottle below. Step Eight – Screw the spray bottle top back on and that’s it… you’re all done and ready to go. Step Nine – If you do end up with any leftover repellent then it can be stored; to keep it at its most effective however, you’ll need to get it refrigerated. Perhaps the most efficient way to use any repellent is to apply it to your skin, however given the garlic ingredient within this recipe it may be wise to avoid this if you don’t want to repel humans as well as ticks! Beyond misting your skin directly you can also use this mist to apply to clothes (just do so at a reasonable distance); it’s also suitable for pets too. If you want to go all out and mix up some natural tick repellent for your skin as well as your clothes then the following recipe is perfect. Step One – Add your geranium oil to the apple cider vinegar, witch hazel or vodka. Step Two – Mix the castile soap into the mixture if you’ve chosen to include castile soap. Step Three – Wait for the mixture to sit for a few minutes, before you go on to mix further. Step Five – Your mixture is now all done, so fill up your spray bottle. Ideally your spray bottle should be made from either glass or a PET plastic, as oils can otherwise leach the chemicals from certain plastics, which essentially contaminates the repellent. This simple recipe is easy to use, and all you need to remember is to shake the mixture well before each use. Simply spray it on exposed skin. This repellent is also suitable for your clothes. As another form of the recipe above you can choose to make this natural repellent in lotion form. This arguably may be a more effective natural tick repellent as the lotion will be naturally absorbed into the skin. This lotion based tick repellent should be stored in a cool, dark place. If stored as such this is a repellent that should easily last for between two to three months. So you are now armed with some natural tick repellent sprays and lotions, let’s natural tick repelling education with a few well-placed tips. This will give you a much better chance of spotting a tick before it has time to sink its teeth into your skin. Wear long pants along with protective footwear such as solid sneakers or hiking boots. You can also increase your protection by tucking your shirt or top into your pants and, in particularly tick abundant areas, by wrapping some duct tape around your ankles and over your socks. This may give you a rather odd style, but it’ll certain ensure that you avoid being bitten! If possible, you should try to stay on well-trodden tracks where over hanging vegetation and planting is minimalized. Overgrown meadows are also to be avoided if at all possible, and what’s more, this tip not only helps you avoid ticks, but additionally allows you to leave a lesser impact upon the outdoor spaces that you love. This tip is particularly important if you’re staying out for a number of days where the chances of a tick reaching you or your clothing is heighted. You should also get a friend to help you out and check the places where you can’t, such as your back. Before you set even so much as one foot over your threshold, you should check over your children and pets, and if just two or three make it in you could find yourself with a fresh littler of ticks to contend with! Ideally this should be within two hours, as ticks can tend to hide away from even the most extensive of overall body checks. But also your equipment, including coats, tents and day packs. Always tumble dry your clothes that has gone on the trip with you. If ticks have happened to latch on or hide away within these then they will be killed off when the dryer is set to a high heat setting (it’s worth noting that more recent research seems to suggest that even shorter drying times may be effective, particularly when the clothing inside isn’t wet to begin with). If you choose to use shop brought, chemically based repellents then you should opt for those that continue between 20% and 30% DEET (N, N-diethyl-m-toluidine), as this is most effective. Bare in mind however that when choosing such repellents it’s particularly important that you avoid the hands, eyes and mouths (especially when applying to a child’s skin). Always be prepared for being bitten, including within your packing finely pointed tweezers and bite lotion. As well as the plants that repel mosquitoes, we’ve also included a few plants repel mosquitoes AND some other insects such as gnats, ticks & fleas (and other bugs); and plants that protect other plants from aphids & mites etc. Planting and growing insect and mosquito repellent plants provide a great opportunity to get out in the garden and plant some plants which are a perfect mix of beauty and functionality. Some people are sceptical about using plants to repel bugs/insects, whilst others are 100% convinced that mosquito repellent plants do as advertized. My advice is – nothing is going to be as effective as DEET and similar pharmaceutical products, but these plants that repel mosquitoes and other bugs really do help. Many of them a beautiful in their own right, and some also have other useful properties. The thing is – if you take natural plant based bug repellents out of the equation; the only really option is DEET based products. There are serious health concerns about the toxic effects of DEET as it is absorbed into the body through your skin. Children are thought to be most at risk from side effects, as children’s skin absorbs more DEET than an adult’s. Sure, DEET has its place and it is even vital in certain situations and locations, but I think it is always worthwhile to also consider natural cures and solutions rather than just reaching for the pharmaceutical option each and every time. At the end of the day, if you plant some of the mosquito and bug repellent plants listed below, at the very least you’ll be getting some pretty plants that smell beautiful. If however you are still not convinced enough to plant any of these plants that repel mosquitoes and other biting insects, why not check out: All Terrain Herbal Armor DEET-Free Natural Insect Repellent, it is biodegradable, cruelty – free, and contains no petrochemicals or animal by products. Here is infographic with the keypoints, see down below for more in-depth information on each plant. The following plants are known throughout the world to act as natural mosquito repellents. While some work better than others, incorporating these plants into your yard can reduce the concentration of these annoying, and potentially dangerous, insects. 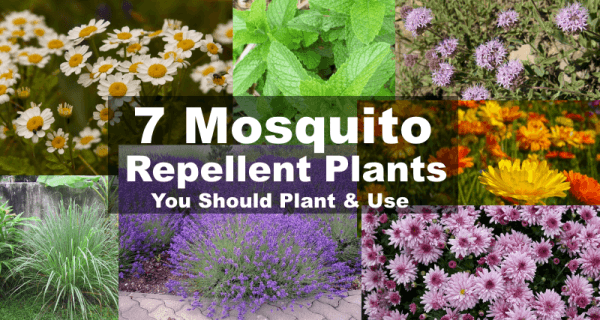 So without further ado, here’s our list of the best mosquito repellent plants. 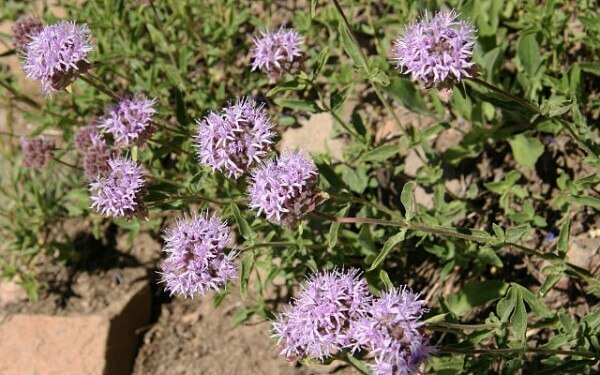 Pennyroyal helps to repel mosquitoes, gnats and also ticks and fleas! In fact it should be your number one natural mosquito repellent plant to grow. Pennyroyal is often used in commercial natural mosquito repellent creams and sprays. Pennyroyal is one of the best bug repellent plants in the garden, but it is best utilized as a natural mosquito repellent applied to the skin. If you crush pennyroyal leaves and rub them onto your skin, this acts as an effective natural mosquito repellent. Additionally, you can also crush the stems and put them in pockets, bags and hats. Natural mosquito repellent for dogs! Crushed pennyroyal leaves and stems can also be rubbed on dogs to help repel ticks and fleas. Actually you will often see dogs rubbing in pennyroyal patches when outdoors. The most effective way to incorporate pennyroyal into your yard is to establish it as a companion plant. Many find success planting pennyroyal close to areas where they congregate. For example, planting near patios and outdoor seating areas. Pennyroyals do exceptionally well when potted. To prevent common fungal diseases that afflict this plant, spray with cooled chamomile tea after planting. Feverfew is beautiful in its own right AND it’s a natural mosquito repellent too! Feverfew is great for repelling mosquitoes and other flying biting insects. It is ideal for planting around outdoor seating areas, pathways and close to doorways and windows; for maximum benefit, plant in conjunction with citronella grass and lavender (see below). Double up with these plants that repel mosquitos etc, for maximum results. In addition to its natural insect repellent qualities, feverfew also has many medicinal uses. It is historically used to help treat nervous disorders, headaches and it also works as a laxative and helps ease bloating. 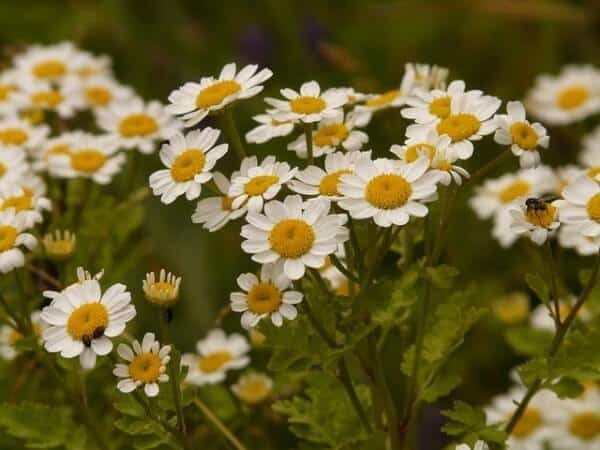 To enhance its mosquito repelling qualities, it’s suggested to plant feverfew near outdoor seating and congregating areas in your yard. For example, plant around pathways and close to windows and doorways. If you have issues with mosquitoes entering your home, plant feverfew outside and indoors near windows. Unlike some of the other mosquito repellent plants, feverfew is quite hardy and does quite well in a wide variety of light and soil conditions. If you’re starting plants indoors, it’s best to group 3 or 4 seeds together in 1/4-inch deep soil. Don’t bury seeds deep in the soil, as this plant is light dependent to spark germination and growth. It’s safe to transplant after the first true leaves have grown. Make sure to give feverfew around 8 to 12-inches of space between other plants. Again, this is one of the best bug repellent plants to grow in your garden. To take advantage of its medicinal uses, harvest flowers when they’re in full bloom and harvest leaves just before the plant starts to flower. Harvesting at these times ensures the maximum concentration of medicinal compounds. 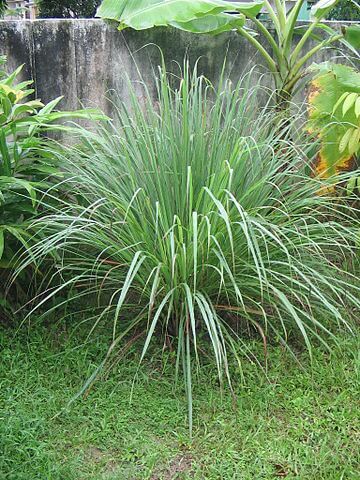 Citronella grass is an old favourite; everyone knows it is commonly used as an insect and natural mosquito repellent in outdoor candles, which are used around outdoor eating and seating areas. Citronella grass is one of the best mosquito repellent plants and it can be planted and used in a similar way as citronella candles, to keep flying insects away. Belonging to the geranium plant family, the fragrance produced by the citronella foliage is known as one of the most effective natural mosquito repellents, which is why it is often found in DEET free natural mosquito repellents. While some proponents claim that by simply growing the plant repels mosquitoes, the actual results are mixed. The bug repelling fragrance produced by its leaves seems to primarily work when the leaves are crushed. Unlike other plants that repel mosquitoes in this list, to maximize your results, you have to do a little extra work. Once the plant has matured, remove several of its leaves. Using your hands, rub the leaves together to crush them and release its essential oils. Rub these oils over your body. For added relief from these bothersome pests, sprinkle crushed citronella leaves around your outdoor seating area. To further maximize the insect repelling results, plant citronella grass in your garden & yard and use in conjunction with feverfew and lavender. Perhaps one of the greatest benefits of citronella grass is its ease. Unlike other bug repellent plants, citronella is quite hearty and capable of being grown in a wide variety of climates. Because of its versatility it can be grown indoors and outdoors. While the plant thrives outdoors during warmer months, make sure to transplant it to indoor locations before the first frost. Citronella prefers a minimum of six hours of sunlight per day – this is regardless of its indoor or outdoor location. While full-sun is preferred, they can tolerate partial shade. Citronella may thrive in a variety of soils, as long as it’s well-drained. To maximize the production of mosquito-repelling oils, occasionally fertilize with all-purpose plant food. On average, a citronella plant can grow anywhere from 2 to 4 feet high. To encourage new growth, pruning and pinching is highly recommended. Additionally, citronella grass has also been found to have a calming effect on barking dogs, which is worth considering if you have a dog which barks excessively day and night. Your neighbours might thank you for at least giving it a try! Belonging to the mint family, lavender is a fragrant herb native to the Mediterranean region. Producing beautiful blue-violet flowers, the oils it creates have a long history being used as a medicinal tincture. Due to its calming scent, lavender oil is most commonly used as a tension-relief and anti-anxiety remedy. Although its uses in the human body are varied, one of its most potent uses is also one of the most under-rated. Lavender is a powerful mosquito and general insect repellent. The oils secreted by this plant effectively ward off these pests through completely natural means. There are several ways you can use lavender to naturally repel mosquitoes. The most effective of these methods is by extracting its oils. To utilize this method, simply grind its flowers and apply to the areas of your skin where mosquitoes like to bite, such as your ankles and arms. Of course, lavender naturally repels mosquitoes by simply growing. Plant lavender around outdoor seating areas, pathways and near doorways and windows. The scent produced by the plant wards off mosquitoes and other bugs. Lavender can be successfully grown indoors and outdoors. Along with its powerful anti-mosquito properties, it’s also a beautiful addition to any home or garden. Cut and or dried lavender can also be placed on windowsills to stop mosquitoes entering the house. Additionally, dried lavender flowers can also be used in wardrobes to repel moths and keep clothes smelling fresh. 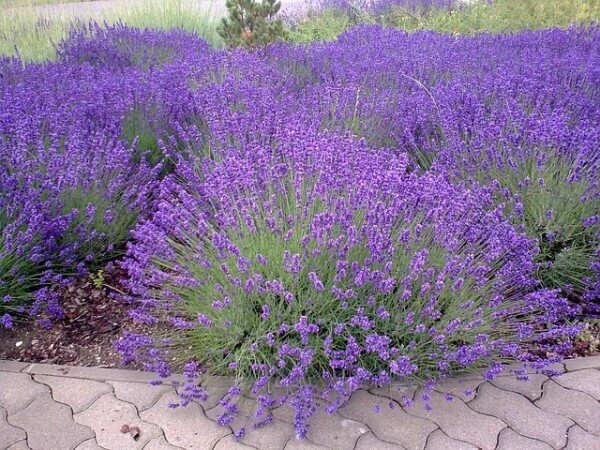 All in all lavender is one of the most versatile plants that repel mosquitoes, that you can grow. Whilst not specifically a mosquito repellent plant, pyrethrum helps to repel a whole host of other insects and bugs, including: aphids, leafhoppers, spider mites, harlequin bugs and ticks. Pyrethrum is best used as a ‘companion plant’ to protect other plants with its insect repellent properties. It is planted close to plants which are affected by the insects above. Additionally a natural pesticide can be made with pyrethrum flowers. The flowers need to be dried and crushed and mixed with water. It is beyond the scope of this article to give specific instructions on potency etc., so please carry out further research before trying this, as even though the pesticide is completely natural, it can still be harmful to humans in certain situations. The oils produced by the Chrysanthemum plant is one of the most powerful natural bug repellents. In fact, the majority of all-natural repellents call upon its essential oil as its primary active ingredient. Not only does its oil repel mosquitoes, but if they come in contact with it the oils, it actually kills the insect. This is an excellent benefit for those dealing with massive mosquito infestations. 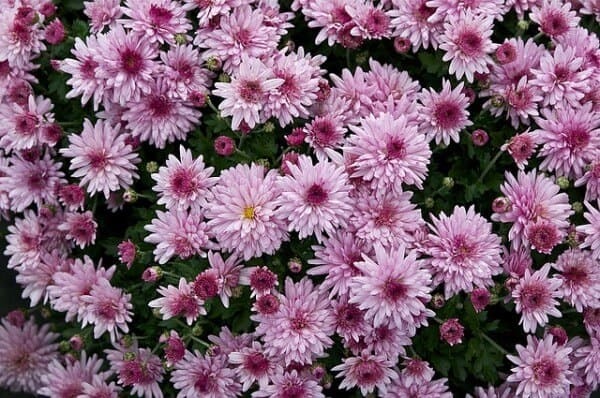 As with many of these plants, Chrysanthemums are relatively easy bug repellent plants to care for, as long as you follow several tips. This plant is particularly susceptible to mildew. Therefore, it’s imperative to keep them as dry as possible. They require ample air circulation, water draining and full morning sun to efficiently dry any dew that’s been deposited on its stems and leaves. Never plant in low-lying or boxed-in areas that feature little air circulation. As for the soil, these plants require fertile, sandy or loamy soil. To ensure maximum health, make sure the soil maintains a pH level around 6.5. These plants are relatively tough and are able to thrive without much external fertilization. In order to keep these plants as healthy as possible, make sure they’re exposed to light. During the growing season, feed with a balanced, all-purpose fertilizer. Marigolds are beautify, strongly aromatic herbaceous flowers commonly found throughout the world. While many choose to cultivate these flowers based upon their season-long blooms and delicious scent, these flowers are also effective mosquito repellents. As with pyrethrum, marigolds are best used as a ‘companion plant’ to help protect other plants; however, marigolds do also have some natural mosquito repellent properties, so it’s a bit of an all-rounder. Marigolds contain a chemical compound called thiopenes in the roots. This plant repels aphids, cabbage maggots, white flies and many other pests. Marigolds are particularly good at protecting tomato plants. 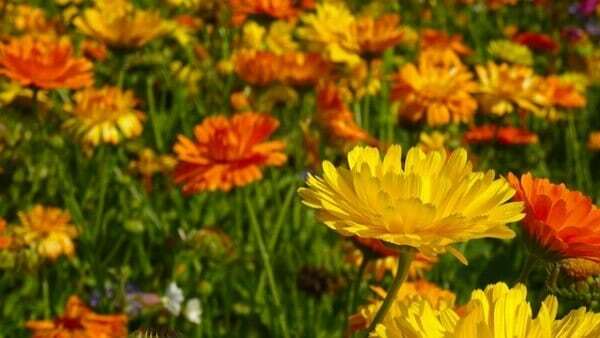 Along with its potent anti-mosquito properties, marigolds are relatively easy to grow. Although easy to care for, there are several tips you should follow to ensure maximum growth. The first rule of thumb to remember is marigolds require lots of direct sunlight. Although they can flourish is almost any type of soil, these flowers tend to do best in well-drained, moderately fertile soil. As spring warms the soil, sow them directly into the garden. If you’re growing from seeds, starts the seeds indoors around 4 to 6 weeks before the last spring frost. When seedlings grow to around 2-inches tall, separate them and plant in flats of loose soil. You may also transplant them into a garden. Once planted, marigolds require very little upkeep. Never water marigolds from overhead. Rather, water at the base of the flowers. Don’t worry about fertilizing these plants. Due to its sensitive nature, excess fertilization causes the foliage to rapidly develop, which reduces flower production. Unlike other plants, marigolds flower best in poor soil. Try to plant these flowers in full-sun as they can mildew quickly if the flowers remain damp from morning dew or rainstorms. Peppermint is one of the most beloved plants due to its strong, poignant scent. A common ingredient in a vast array of products, the peppermint plant does far more than simply add a delicious flavor to treats or toothpaste. The majority of bugs despise the scent and taste of peppermint. Its strong essential oils waft effortlessly through the air to naturally repel mosquitoes and other common insects. 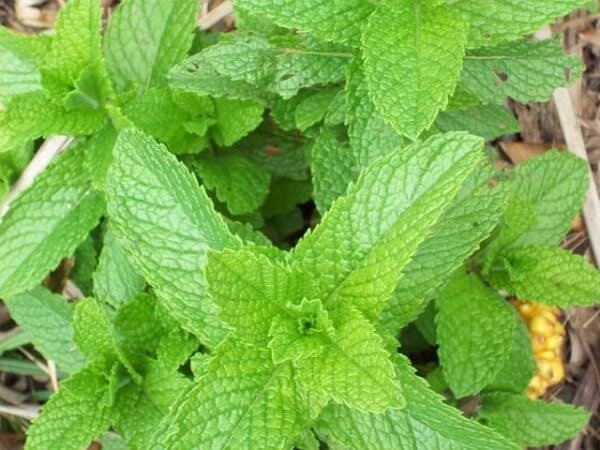 Planting peppermint along outdoor seating areas, around windows or near doorways is an effective way to naturally repel mosquitos and other bugs. Another added benefit? Should you be bitten by a mosquito, rubbing its leaves directly into the the bite offers near-instant itch relief. Double benefit! It’s a plant that repels mosquitoes and it provides mosquito bite relief. An excellent benefit of growing peppermint is its ease. As with any other plant belonging to the mint family, peppermint is fast growing and requires minimal care. When growing peppermint outdoors, plant about 2-feet apart in moist soil. This plant spreads quite rapidly and requires a decent amount of room to flourish. At its peak, peppermint grows around 1 to 2-feet tall. In your garden, plant peppermint near tomatoes and cabbage to thwart pesky insects. While these plants tend to do best directly in a garden, they also do quite well in pots. Fill a container with compost-enriched potting mix and place close to outdoor seating areas. The only requirement is these plants require full sunlight to truly flourish. Unlike other plants in this list, peppermint does best in moist soil. When planting outside, use a light mulch to help keep the soil moist. Water the leaves regularly to keep them clean and to maintain high oil production. When growing peppermint indoors, make sure to water them regularly. Focus on maintaining even soil moistness. To enhance the mosquito-repelling effectiveness of peppermint, pick several mature leaves from the plant. Mince the leaves into tiny pieces and scatter across your entire outdoor sitting area. Many perform this action immediately before holding an outdoor party or enjoying a nice glass of wine and a book. While the plant itself will help repel mosquitoes, by mincing the leaves and spreading them, the oils are released in greater concentrations. Consider rubbing a little of the minced leaves across areas of your skin where mosquitoes like to bite. However, be careful when doing this. If you have sensitive skin, the oils can cause a rash or irritation. Test on a small portion of your skin and wait 20 minutes. If no reaction occurs, apply to a larger area. Did you know there are over 3,000 different mosquito species throughout the world? While each mosquito has a unique scientific name, their presence to humans and animals is relatively similar. As with most insects, mosquitoes lay eggs to reproduce. These eggs are often found in still, calm waters and float on “rafts.” One of the greatest preventative measures is to eliminate water accumulation in your yard. There are four stages a mosquito goes through: egg, larva, pupa and adult. During the egg, larvae and pupae stage, the mosquitoes live in water. However, as they molt into the adult stage, they fly away from water sources and become airborne. As summer temperatures rise to 80-degrees Fahrenheit, the larva goes through a rapid transformation. On average, it takes four days for larva to reach the pupae stage. From here, it takes an additional three days before the pupa transforms into an adult mosquito. The lifespan of a single mosquito is relatively short. Female mosquitoes may live for several weeks if they have a constant source of sugar while male mosquitoes typically live for less than a week. The primary difference between adult male and female mosquitoes is its size. Generally, female mosquitoes are larger than males and have a threadlike antennae. Male mosquitoes feature a more bushy antennae. Unlike popular belief, mosquitoes find nourishment on more than just blood. Both male and female adult mosquitoes feed on nectar. However, when it comes time to lay eggs, female mosquitoes seek out warm-blooded hosts to feed on their blood. Male mosquitoes don’t feed on blood. It’s difficult to imagine these annoying pests have any purpose outside of ruining your outdoor enjoyment, but they have several important purposes in your local ecosystem. Mosquito larvae serves as a viable food source for fish and other aquatic animals. As the mosquitoes grow older, they become an important food source for bats, birds, spiders, dragonflies and other arthropods. Without these insects, entire animal groups would lack in nourishment. Of course, with a positive benefit comes a negative. Perhaps the most noteworthy downside of mosquitoes is their ability to transmit dangerous pathogens to humans and other warm-blooded animals. Mosquitoes can transmit diseases, such as encephalitis, dengue fever and yellow fever. It’s important to note these insects can only be carriers of disease, they cannot spontaneously cause disease. For example, a mosquito must feed on an infected host in order to transmit a pathogen. There are few situations that can be as uncomfortable as a urinary tract infection, or more commonly referred to as a UTI. In the most fundamental sense, a UTI is an infection that afflicts the bladder, urethra, kidneys or ureters, causing pain, discomfort and a need to urinate, plus a burning sensation when urinating. Because any part of this essential elimination system can become infected, it’s important to utilize treatments capable of delving throughout each of these bodily parts. Since over 7 million people visit a physician for UTIs every year, it’s among the most common infections throughout the country. If you’re searching for relief from a UTI, then you should immediately begin treatment. Although UTI home remedies can be an effective way to banish this painful infection, because of the risk associated with such an infection, it’s important to visit your physician should your symptoms worsen after self-treatment. The following UTI home remedies were chosen due to its effectiveness at relieving the severity of symptoms (pain, discomfort and burning urination) and banishing the infection at the deepest parts. While these UTI home remedies are considered safe and effective, should your UTI symptoms worsen within one week of starting treatment, immediately visit your physician as you could be dealing with a potentially serious infection. While this may seem too simple, drinking ample water is the most effective way to flush this vital bodily system to help calm symptoms and promote swift healing. As a general rule of thumb, drink half your bodyweight in ounces of water. For example, if you weigh 160 pounds, drink at least 80 ounces of purified water per day. While the act of urinating may be painful, avoiding ample hydration is the biggest mistake you can make when it comes to restoring your urinary tract health. One of the most uncomfortable symptoms of a UTI is the near-constant urge to urinate due to a burning sensation. An effective UTI home remedy involves drinking baking soda water to actually neutralize the acidity within urine. Although baking soda does not actively eliminate the bacterial infection responsible for a UTI, it can reduce pain and burning sensations. To utilize this UTI home remedy, simply pour 1 teaspoon of baking soda into 8 ounces of filtered water. Stir until the baking soda completely dissolves and drink first thing in the morning for at least one week. One of the major causes of UTI pain is due to inflammation caused by an active infection. One of the most potent UTI home remedies is ginger tea as it features unique anti-inflammatory properties. Its unique active compounds hinder a biological process known as prostaglandin synthesis. By blocking this process, the chemical messengers responsible for triggering inflammation and pain signals, inflammation is reduced and pain is numbed. In fact, this natural process is the same many synthetic medications try to accomplish. To utilize this remedy, simply brew 1 cup of fresh ginger tea and consume up to three times per day until your UTI has subsided. The active compounds found in blueberries thwart UTI infections by disturbing the health of the bacteria that causes urinary tract infections. By affecting bacterial fimbria, its life-cycle is shortened, which results in faster healing. To utilize this home remedy, simply consume 1 to 2 cups of blueberries per day. The constituents found within apple cider vinegar make it one of the most effective UTI home remedies. Filled with a variety of enzymes, minerals and potassium, apple cider vinegar interacts with the bacteria responsible for the onset of a UTI. By inhibiting this bacteria from growing (or multiplying), you can experience swift healing and relief from painful symptoms. This UTI home remedy is quite simple to utilize. Simply add 2 tablespoons of apple cider vinegar to 8 ounces of water. Add 1 tablespoon of raw honey, for taste, and drink two times per day for one week. One of the most effective ways to naturally banish a UTI is to increase your consumption of vitamin C. Indian Gooseberry, also known as Amla, inhibits the growth of UTI-causing bacteria due to its high vitamin C concentration. To utilize this home remedy, add 1 teaspoon of Indian Gooseberry Powder to 1 cup of water. Place over high heat and bring the solution to a boil. Allow this mixture to boil until the water evaporates. Scrape the residue out of the pot and consume up to three times per day for a maximum of five days. By evaporating the liquid, you create a residue rich in vitamin C for potent healing capabilities. The powerful antibacterial properties found within tea tree oil make it one of the most effective UTI home remedies. Unlike many other of the remedies listed, this method works through a topical treatment. To utilize this remedy, run a warm bath and place 10 drops of pure tea tree oil into the water. Lower yourself in the water and wash your urethra opening with this water. Soak in the tub for 20 minutes. Repeat once a day until the infection has stopped. Considered one of the most beneficial UTI home remedies, the active compounds in pineapple are known to help reduce pain and symptoms of a urinary tract infection. 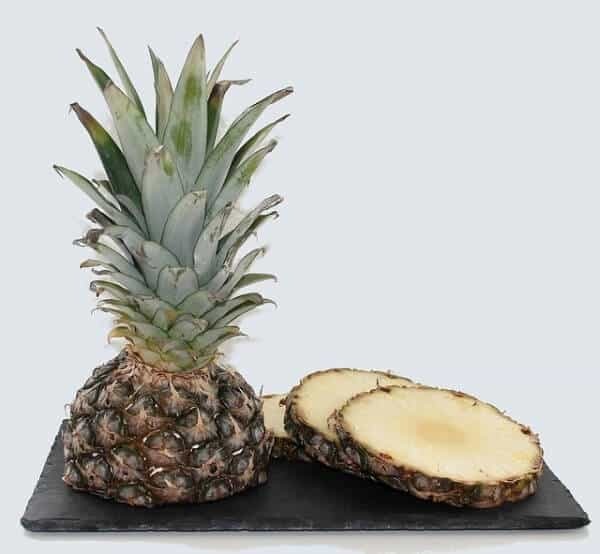 The bulk of this fruit’s medicinal benefits is derived from an enzyme known as Bromelain. This enzyme features powerful anti-inflammatory properties, which actively works to reduce UTI symptoms. When combined with antibacterial herbs or medicines, pineapple helps to bring near-instant relief. To utilize this remedy, consume 1 cup of freshly cut pineapple per day. Do not consume canned pineapple as it typically consists of excess sugar and preservatives. Uva Ursi consists of a variety of active compounds known to hold powerful antibacterial and antiseptic properties. Research has found this herb to be among the most effective natural UTI home remedies. To utilize this remedy, consume a fresh Uva Ursi supplement. Make sure the supplement contains 100% Uva Ursi for maximum effectiveness. Continue to supplement with this herb until the UTI has been cleared. As stated above – these UTI home remedies can be very effective when used early, and for minor UTIs. However if your symptoms continue or get worse, please visit your doctor right away for treatment and diagnosis. Whilst fleas are a major concern for most pet owners, some people may consider fleas to be nothing more than a minor ailment for your pet; however if left unchecked fleas can wreak havoc on pets and humans alike. Fleas are problematic as they survive on blood. In fact, a female flea can consume up to 15 times per body weight in blood every day. Fleas are not only a nuisance, but they can also cause serious health complications, such as tapeworms, anemia and flea allergy dermatitis, known as FAD. Although they are wingless, these pests can easily jump from pet-to-pet or from pet-to-human, and from room to room around your home. If you’re looking for ways to get rid of fleas without having to use synthetic chemical treatments, then read on, as the flea home remedies and the homemade flea trap below will soon have your pets and household flea free. The following home remedies for fleas were chosen for their effectiveness and safety. The majority of flea infestations can be controlled and eliminated via these natural methods. To be honest, you don’t really need to look any further than remedy #1 (DE powder) and remedy #2 (flea trap), but the other home remedies are included here, as they are popular and reported to be effective. NEW POST: Get rid of fleas from your yard/garden with this garlic flea spray for your yard. Diatomaceous Earth (DE) is actually comprised of ancient algae fossils. Upon contact, the microscopic fossils actually penetrate through the fleas outer shell, and are then soaked into their bodies. Due to the dehydrating effect of DE, fleas are dried out and ultimately destroyed. This remedy is so powerful, DE is often the primary ingredient in all-natural pest cleaners. Important note: only purchase and use ‘food grade’ diatomaceous earth powder. Other forms of DE, for example, pool DE, can have added harmful chemicals. ‘Food grade’ DE should be clearly labeled as such ‘food grade’. To utilize this remedy, thoroughly vacuum every room in your home. After cleaned, sprinkle an even layer of DE throughout every room of your home. Focus on areas where humans and pets congregate as this is typically where fleas rest. After the DE powder has rested for 48 hours, vacuum clean. Repeat as many times as necessary to eliminate an entire flea colony. DE really is one of the most effective natural home remedies for fleas, but an added bonus around the home is it also kills ants, spider and cockroaches too! If anyone in your household suffers with chronic allergies, or skin conditions, it is might best to treat/test one room first (before doing the whole house! ), and check for any reactions. DE is considered safe for household use, but you can never be too careful if anyone in your household suffers with a chronic condition. Using Diatomaceous Earth Powder Directly On Pets? Food grade diatomaceous earth powder has been used on livestock, all over the world, for decades. 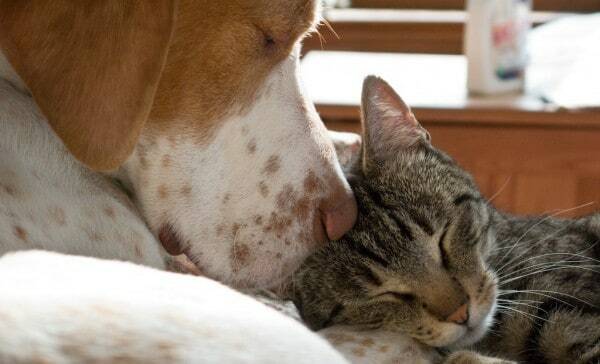 It is widely considered safe to use on pets as well. The main caution with using DE on pets is that inhalation of DE should be avoided by humans and pets, as it can cause respiratory irritation, so be mindful of this when using DE powder. If you are worried about skin irritation, and want to be doubly careful with your pet, try treating a small area of your dog/cat with DE powder for a few days, to see if there is any skin reaction. If all is well, you can proceed to applying the DE powder head-to-foot, being careful around the head area, so that the DE is inhaled. You may need to repeat every few days for heavy flea infestation. Personally, given DE’s effectiveness at killing fleas, I really cannot see the point in purchasing harmful pesticides and spraying them all over your home. Diatomaceous earth is a safer, natural alternative, that is equally lethal to fleas. Perhaps one of the most effective home remedies for fleas is to catch these pests before they have time to influence their bite on pets and humans. Although there are many commercial flea traps available on the market, they can be quite expensive. This home remedy for fleas calls upon everyday items to effectively catch and trap fleas throughout your home. 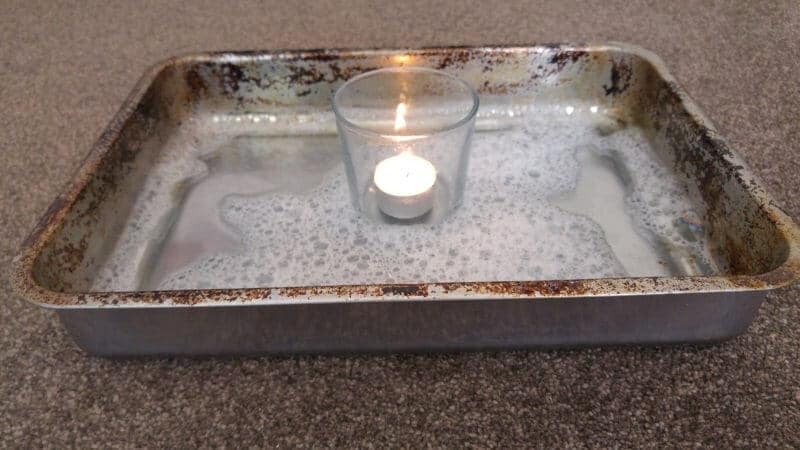 Place a baking tray or plate filled with warm water in the middle of the room. Add 1 teaspoon of dishwashing liquid to the water and agitate to make the water soapy. Place 1 tea candle in a jar, in the center of the baking tray/plate and leave overnight. Throughout the night, fleas are attracted to the heat and light coming from the candle. When they jump toward it, they become stuck in the dishwashing liquid water and die. Repeat for three to four consecutive nights, or until you do not wake up to flea bodies in the water. Homemade flea trap caution – don’t allow pets to access the area the flea trap is located in. They may drink the soapy water, or burn themselves on the candle. If you don’t want to use a candle, you can also try standing an adjustable lamp on the floor, with the light shining into the center of the baking trap/plate. Pets should still be excluded from the area due to the danger of the proximity of the lamp to the water in the flea trap. Below is a photo of one of our DIY flea traps. To be honest, this old baking tray has much higher sides that our other two traps. I’d have assumed that lower sides would be better, as it’s easier for the fleas to see the light, but this trap works just fine Quick and simple to make, and mighty effective! Once you’ve combined all of these ingredients, pour the solution into a standard handheld spray bottle. After vacuuming the room, spray a liberal amount of this solution throughout your room. Pay attention to corners where carpeting and walls meet. Repeat every day until the fleas have been eliminated. Enhance the effectiveness of this spray by steam cleaning your carpeting and cloth-covered furniture. The steam actively works to kill flea larvae, which can be protected against the spray. Many ‘all-natural anti-flea powders’ utilize sodium as a means of eliminating these annoying pests. In the most fundamental sense, salt works to kill off fleas by penetrating its shells and dehydrating the fleas from the inside-out. 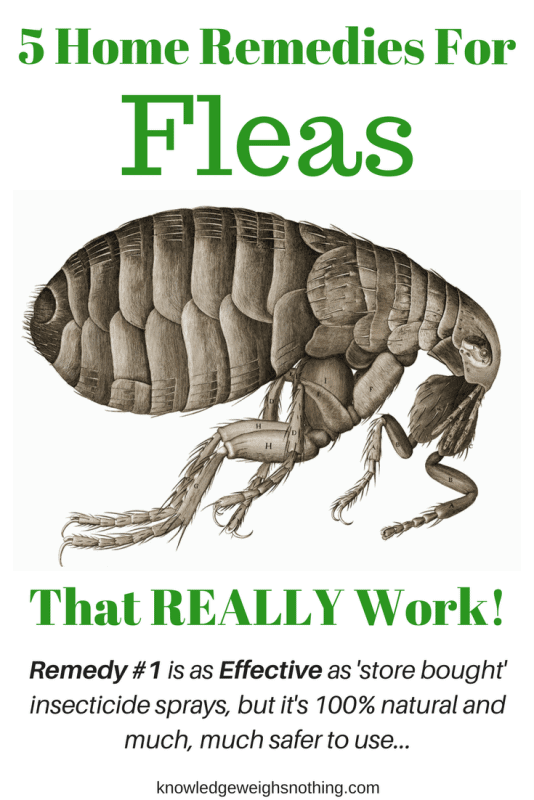 This is an effective, chemical-free, home remedy for fleas that is surprisingly easy and effective. To utilize this remedy, simply purchase finely ground sea salt. In order to work, the salt must be ground to a fine powder. If your salt crystals are too large, grind until it’s a fine powder. The amount of salt you’ll need depends on the size of your room. Once the salt is finely ground, sprinkle throughout every room in your home. Make sure there is an even layer on the carpet. Allow the salt to rest for 48 hours before vacuuming. Repeat until your flea infestation has been eradicated. Once all these ingredients are in the coffee grinder, grind them together until a fine powder forms. Remove from the coffee grinder and place in a resealable container. Sprinkle the powder throughout your home. Focus on areas where fleas are often found, but also sprinkle in less-active areas. This is an excellent powder to sprinkle around openings of your home, which makes it act as a flea repellent. Allow the herbal flea powder to rest for 48 hours before vacuuming and repeating. Consider using this home remedy for fleas as an everyday preventative treatment; especially during the warmer months when fleas are most active. Follow Us On Facebook & Pinterest!